Birds, birds and more birds! Today my partner and I spent the morning conducting a bird survey on the expansive grounds of Kinloch Farm in The Plains, Virginia. The field, Kinloch Wild, hadn’t been mown or planted in several years, so it was brimming with native plants and birds. We were inundated with different types, from the common Field Sparrow and Red-Winged Blackbird to Bobolink, Bobwhite Quail, Turkeys and Green Herons. A true birder’s heaven! I was so pumped up that when I returned home I set up my workstation on the deck in my backyard, my trusty Peterson’s field guide and binoculars by my side. 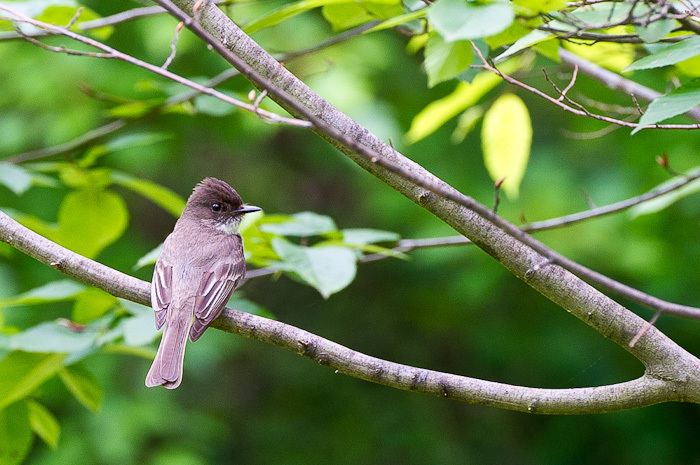 Turns out I even identified a few new species in my backyard, including the Eastern Phoebe and a Brown Thrasher. In addition, I was entertained by the resident American Redstarts and Chipping Sparrows flitting around, and a Yellow-Throated Vireo even landed on a deck chair next to me to check out the bird calls I was playing on my iPhone. All in all, a glorious day to hang out with the birds. Nice shot. Brings back memories. I have not been birding in some time–I started in South Texas and was spoiled with all the birds everywhere. I still keep an eye out, no matter where I am. Thanks for sharing.